A recent survey from Kaspersky Lab has confirmed this trend in behavior after three-quarters of people (75%) admitted they use a device to pretend to be busy when they don’t want to talk to someone else, showing the importance of keeping connected devices protected under all circumstances. Imagine you’ve arrived at a bar and you’re waiting for your date. The bar is busy, and people are chatting all around you. What do you do now? Strike up a conversation with someone you don’t know? Grab your phone from your pocket or handbag until your date arrives to keep yourself busy? Why talk to humans or even make eye-contact with someone else when you can stare at your connected device instead? 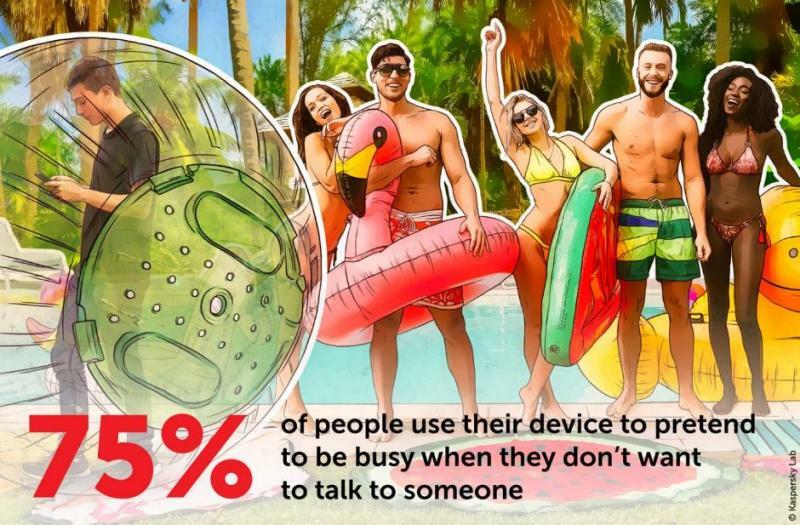 The truth is, our use of devices is making it much easier to avoid small talk or even be polite to those around us, and new Kaspersky Lab research has found that 72% of people use one when they do not know what to do in a social situation. They are also the ‘go-to’ distraction for people even when they aren’t trying to look busy or avoid someone’s eye. 46% of people admit to using a device just to kill time every day and 44% use it as a daily distraction. In addition to just being a distraction, devices are also a lifeline to those who would rather not talk directly to another person in day-to-day situations, to complete essential tasks. In fact, nearly a third (31%) of people would prefer to carry out tasks such as ordering a taxi or finding directions to where they need to go via a website and an app, because they find it an easier experience than speaking with another person. Whether they are helping us avoid direct contact or filling a void in our daily lives, our constant reliance on devices has become a cause for panic when they become unusable. A third (34%) of people worry that they will not be able to entertain themselves if they cannot access a connected device. 12% are even concerned that they won’t be able to pretend to be busy if their device is out of action. “The reliance on connected devices is impacting us in more ways than we could have ever expected. There is no doubt that being connected gives us the freedom to make modern life easier, but devices are also vital to help people get through different and difficult social situations. No matter what your ‘connection crutch’ is, it is essential to make sure your device is online and available when you need it most,” said Dmitry Aleshin, VP for Product Marketing at Kaspersky Lab. I want to use my device while waiting for a friend – is it secure to access the bar’s Wi-Fi? Oh no! I’m bored but my phone’s battery is getting low – what am I going to do? I’ve lost my phone! How will I keep myself entertained now?